This is the full list of comments people made about problems that had with tools and equipment at school because they were left-handed. We have taken out a lot of the duplicates. A bit odd, but the rota-cutter. It would cut right to left so it was a bit of a pain to cross my left hand over to use it. A paper cutter is not designed for a lefty at all. a ruler! the measurements are upside down! Pertractor, I measure from the wrong side! Actually at university, in lecture halls they have desks attached to the chair that are ont he right hand side to take notes and put your files. It is impossible as they are connected to write. You have to sit totally side on and then you can't see the lecturer, you can't move your chair as it is part of the contracption. We worked out how to lift off the desk part and I just wrote on my lap - not good for my back. Horrible, I hated all my lectures in those rooms because of it. I lived in NYC for a few years and they have those chair/desks things in school rooms, but apparently they do make lefty versions now. All my school had were right handed guitars, so in music, I learned how to play the guitar right handed...I was pretty mad. All of the standard machinery in the Design & Technology workshop; the tools like pillar drills and bandsaws even have all the emergency stop buttons in inaccessable places. the other tools like tin snips and guillotines aren't so deadly to misuse, but it's still awkward. all the wood/metal work tools were right handed. Always, from ring binders to doors! As a professional picture framer I found that most of the mat cutters were made for right handed persons. At least the manual urinals have flush handle on the left. at my job now there isn't anything such as left handed anything..but I know as soon as I open my business, I will definatelly have alot of my equiptment adaptable to me. But you know, since I 've had to adapt to the right handed world, I 'm not sure I could get used to using my left hand more for daily tasks it might make it even harder... I 'd have to start all over again, but I know for a fact, that when and if I have children and one of mine is left handed, I defintally am going to get them all the right tools I wasn't able to have. At work, using a guillotine or paper cutter. Baseball gloves: my mom had to buy a special one for me. Being an A level textile student, I have to provide my own fabric scissors, or get someone else to cut fabric for me, as it is practically impossible to cut with the provided scissors. Binders, desks with a right hand extension to write on. Can get annoying with ruler and some DT equipment but just get used to it and use my right hand - also with computer mice its hard as there isnt always enough cable to move it. Can't remember specifically, but we had guillotine paper cutters with the blade on the right. No wonder lefties are said to be more accident prone! chairs that have writing surfaces you can pull up and lay flat to write on. They were always on the right side. Sometimes you might find one for lefthanders that allowed you to rest your arm while you write. Mostly I had to suspend my arm in mid-air to write because there were so few left-handed chairs. Chalk and dry erase markers are nearly impossible to use. Also, albeit a little silly, I always had trouble tying shoes until a left-handed person showed me how they did it. Shoe-tying proficiency tests in the earliest school years were always dreadful. chalk boards, sissors,bathroom stall doors, desks. Anything contoured for right handed ease. chalk on the chalkboard, as you write , your hand smudges it off. Chalkboards, whiteboards, overheards...anything that's made by a right-handed person for the masses, that either is awkward to use or is messy. Computer mice- they are contoured to the right hand so they cannot be switched to the left side. Computer mice, but I am too used to useing it with my right hand. computer mouse scissors writing at my table writing in my school journel. Computers were hard at first because the mouse is always on the right side. could not write on the chalk board. Craft knives in Design Technology. Desks always cut off cirulation because my arm always hangs off of the small right hand desks. Desks were number one. Scissors. Desks with Ink Wells on the right. Chairs that only accomodated right handed writing. Pencil sharpeners that didn't sharpen if you did it left handed. Smearing chalk boards. 3-ring binders that dug into my left arm. There is probably more, but it was too long ago to remember it all. desks with the chairs attatched don't provide the space I need to write. Desks with the writing platform on the right. desks, if any there would only be one or two desks for left handers and they were always in the back corner so I wouldnt be able to see the board very well or sometimes hear the teacher. desks, pencil sharpeners, limited left handed eqipment. Doors in general are made for Righties. But not much I can do about that. Drafting equipment would not work left handed. Sometimes it works if you do your maps and desing upside down and backwards. Dry Erase Markers. As you know schools don't really use chalk anymore (though I used to smudge that too). Most school now use dry-erase boards. It's hard to write on because it was obviously created for a right handed person. DT, general cutting saws, disk sanders, vices. Edward's primary school also provides left-handed saws although children who are right-handed also use these as they forget that there is a difference between the saws. Sometimes the teachers forget to remind the children which coloured handle saws are for which handedness. Equipment I find hard to use is pencil sharpners scissors (sometimes) notebooks and binders with the spring and bind on the right side it does not give me enough room to write with the springs and bind right there. Especially in computer classroom in which the computers are next to each other. Even the lefty scissors are old and crappy and alot of the other school supplies are for right-handed people but I'v gotten used to them. everything, right down to door knobs were difficult when I was little. Fountain pens. 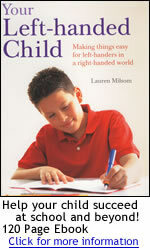 I think that as a teacher I confused pupils and students alike with my left handedness. I think it was a distraction for them. gloves for the softball team. There were no left-handed ones and I learned to catch the ball, take off the glove and throw the ball faster than any kid in my grade. You adapt! Had a hard time using a mouse, now that I am used to using it Right handed, I would be compleatly lost with a left handed mouse. But I can not use the mouse to creat a signature because of it being Right handed. I absolutly hate using spiral notebooks. They dig into your wrist and you always smudge your writing a lot. I always struggled with food technology (which I took through to A level) because of a total lack of equipment of left handed equipment, knives in particular. Scissors were another problem, in five years at secondary school and two in sixth form I never once came across a pair for left handers. I am not a student anymore but I work at a school. Throughout my life I have had to adjust. i can't drum on a right-handed setup drum kit. I dont think there is. I find it hard to use the pencil sharpener. Also, even though I am left handed, I am unable to use the left handed scissors that are offered. I find using pencil sharpeners hard. They are usually situated on desk or walls and it is hard to work with them. I find using white boards in my day black boards) difficult as smudging still happens - I use these at work! I found it very hard to use right handed scissors. We also used to have singluar desks that would fold up, they were right handed. Sewing was a nightmare because the teacher would do it right handed and I would ask her how do I do it left handed and she would just tell me to work it out myself! I found shorthand to be quite difficult because it wasn't natural and had to be learned by rote rather than logical. I found some projects difficult in a Fiber Arts class b/c I was left handed. I had a hard time with a lot of things. When we did activities in gym we were always taught to do them right handed, which seemed awkard but eventually worked. Any type of cutting or arts and crafts were difficult because the left handed supplies they provided did not work well. By high school I started teaching myself to function with what was provided but as a child it was almost embarrasing to be left handed. I hate margins on the left, and excersise books are annoying too. I hate right handed rulers. They are all backwards. Now, as an adult, I bought my own for my office!! I hate sprial notebooks because in order for them to be comfortable for a lefty, they need to be turned upside-down. I always had problems with laying my hand on the metal spiral It made notetaking very difficult. I have always been a bit of an ambidextrous person, so I never had difficulty adapting to right handed tools etc. I have problems using the school's scissors and I always smudge my writing. The smudging gets even worse when the school has this very good-looking, but smooth paper. I just learnt to adapt. I know it sounds crazy but I've always had issues with hole punches. I know that every now and then I come across something but since I'm used to it it's become no big deal to me and I cease to pay it much attention (except the occasional complaint to a classmate). (i.e. the blade of the scalpel in a dissecting kit was on a side that made it difficult to cut with in the left hand). I need left-handed'teacher' scissors or right-handed ones press into my hand. I can't use manual desk pencil sharpeners 9the type that have a handle to turn.) I've never got my head around why they're such a problem, I just can't do it. I say no because I just learned to use whatever was available. I used to sit on a desk which has an arm rest/arm support for right-handers. I had trouble writing as my elbow has got no support. I wanted to learn to play the drums but they wouldn't change them to suit a left hander so I gave up. I was always expected to just accommodate myself to all things right-handed,and when I explained how awkward this was,I was just told that it "...couldn't be that difficult",and told to get on with it. I work in files for I.C.T, R.E, and maths and I find that difficult. in college the desks are a nightmare. there is usually only 3 or 4 left handed desks in a class of 400. (the pull up kind). In anatomy class, all the kits are for right-handers, scissors, scalpels, speciel dissecting blades. In college, the desks were all'half desks,' and were all right handed. In cooking class I could never work the manual can opener, I just got someong else to do it fr me. The teacher was left-handed though... I guess it's just a skill I have yet to master. In food technology it is sometimes hard to cut up certain foods or peel things like potatoes as all of the knives are right handed. Sometimes it is also difficult to use the school computers as the mouse is always on the right hand side, and sometimes they are difficult to move to the other side, as the wires are too short or trapped under the computer. In Home Economics in School, I could never use the peelers, the were the older style ones, with the blade made for a right hand! Wiping off what I wrote on tehe boards, and also blocking the board sometimes trying to rectify that. In my math classes we used a compass and a protractor and I could not figure out how to draw the circles with the pencil in my left hand so I always had someone else draw my circles for me. In middle school you are required to take an industrial tech class were you learn how to use hand tools, saws and other large tools. All of the tools were built for the right-handed individual so I had to watch other students make thier projects or had to have someone else cut, burn or drill my project for me. In one of my classrooms they have desks that fold down (they are attached to the desk) and they are on the right side. The desks are not very big either, so it is really hard for leftys to use them. In photography when you have to develope pictures it is very hard for a lefty because everything is on the right side of the equipment. Inserting film and focusing the picture becomes a huge task. in textiles there are no left-handed scissors, and cutting fabric is very difficult and takes a long time. in wood working we have to draw blueprints with T squares and they are very hard to use when you are a lefty. Rulers are tricky too because they are always upside down when I feel they should be made diffrently. In Woodshop I had a lot of trouble learning to saw and use machines. Also in Textiles I had trouble with sowing machines. in woodshop most or the tools were for right-handed people and I was always afraid that I was going to hurt myself. It isn't a specifically left-handed problem, but flat writing surfaces are a problem so the school got me a sloping writing board. It's been a long time, but everything was backwards for me! It's hard to use the boxcutter. It's hard writing on a white board because of smudging. I've learned to use both hands for 99% of the tasks/activities I'm involved in. I've naturally adapted to using some tools with my right hand. Otherwise, for example, some of the scissors available would not cut through anything when used from the left hand. Just scissors is all that I can think of right off. kitchen knives - blades on the wrong side. those chairs with the table built onto the side - they're designed for right handed people so the table is o nthe wrong side. knitting needles, scissors,lecture-hall desks, computer mouses. Knitting! The teacher went around to everyone helping and didn't help me to start off and finish off. To this day, I have to get a right-hander to start me off. learning to play games, I .e. baseball, etc. Manual pencil sharpeners are awful to deal with. Markers - they also smear. Paint bushes. Measuring because the hand covers up the measure while drawing and someone stole my left handed rule. Although protractors go both sides the left handed side is on the inside. Writing in a book, holding the page open and writing at the same time meant arms were crossed, it would be easier if left handers could write from the back of the book! Mostly the scissors they use to hurt my hand. mouse on the computer had to ask for the lead to be fed around the monitor so that I could use it with my left hand. My agenda, too small and full of smudges. That is the reason why I never use an agenda. No difficulties seen as a teacher. Normal rulers and the "blackboard right-angled triangle"
not really, but it would just take a little longer to figure things out if I watched a right handed teacher showing how things worked. Notebooks, I get the wire binding imprinted on my habnd. Occasionally we had to use a big paper guillotine that was set up for right handed use. I used to find it difficult to use. When I first started using a computer it was annoying having to use the mouse right handed but now I'm used to it it's very useful being able to write at the same time. Paper cutters, prpjectors, things like that are all set up for right handed people. Peelers - pastry forks and I seem to struggle cutting meat. Even now, despite my mum and dad showing me time and time again - I still sometimes ask people to cut it up if it is a bit tough ! (I also have bending finger joints so pressure on them tends to make them bend rather than gain strength). Pencil sharpener mounted on the wall. Pencil sharpeners and the desks in general. Scissors, Desks with the opening on the left side instead the right. Playing hockey was a nightmare. Portfolios with the note pads on the right side. protractors are a pain. The chairs with the little tables are always on the right. Makes one sit at an angle. Right handed desk in High School. Chalkboard. Right handed desks are a challenge as I had to turn to get to the desktop. This in turn made it challenging to sit in a certain part of the room so I could still see the board and the teacher. I also have trouble with spiral bound notebooks, and if using a three ring binder, must take the pages out for writing. Because the left handed scissors provided were too dull to work with, I managed by using right handed scissors upside down in my left hand. right handed-scissors, I carry my own left-handed ones now. Right-handed sewing scissors, hockey sticks and cricket bats! Ring binders. If we're not allowed to take the pages out I can't write in them. Rulers are for right handed people. I always had to read the numbers upside down. Rulers, I find them vey hard to use even nowI usually turn them round the other way. rulers, pencil sharperners, wipe-off boards, protractors. scissors and knives with one sided blades. Scissors and rulers, pencil sharpeners. Scissors and using computers are hard because in my school we aren't allowed to move the mouse to the left side. scissors do not cut when uesed in the left hand and feel so uncomfortable in the right hand. When writing my hand get dirty from the smug and the same with drawing. Scissors!!!!!!!!!!!!!!! Techniques which required doing a mannual thing with your hands, I could never get the hang of them because I couldn't figure out where to put my hands! Sewing machines are a menice as well. Throwing a javalin was difficult; in some sporting situations the teacher asked if there were any left handers, I found it really embarrassing to say yes because I was going to be treated differently and people used to look at me. Scissors, and the pencil sharpner. scissors, can openers and peelers in the cooking suite, many of the machines in the design centre would involve me having to lean over the moving machine to depress the stop button with my left hand (dominent hand - which I would automatically use to hit the button), some of the tools had specially designed handles that made it impossible to use with your left hand. Scissors, can openers. Everyone laughed at me in home ec because I could NEVER figure those stupid can openeners out. Scissors, hockey sticks (they're only right handed). Scissors, rulers, pens, pencils, notebooks, binders, etc. Scissors, sewing machines, lab equipment, sports equipment. Scissors, they never cut the paper nice, it is like it just rips it. Scissors--I never cut as straight as my right-handed classmates. Some rulers are hard to measure with and cutting tools in art & design are not easy to use. Sometimes computers are laid out backwards. Sometimes when you are writing in a folder, the metal bit in the middle of the folder gets in the way so you have to take the paper out to write on it. Sometimes, when I am learning a new art method (pottery wheel) I will have a difficult time trying to do something left handed when the demonstration is right handed. I will get confused and end up not being able to learn either hand. This has been true with crocheting and a pottery wheel. Spiral notebooks are often a requirement in classes, and I have yet to locate a left-handed spiral in any common office supply store. spiral notebooks, felt tip, some ink pens, desks, etc. Spirals, desks that are designed for right-handed people, and scissors. table, there's a type of table that support righties' arm but not lefties', so after your wrist suspend in the air for a while the whole arm start to ach. since there's a supporter on the right, there is no room to lean against for comfort. That big paper cutter that cut like twenty sheets at a time. And all the projector equipment was hard to use when I was on the Audio/Visual squad. The arm desks are a pain! There's nowhere to rest my arm when I'm writing. The carpenters benches; the position of the vice for right handers, and the bench block for holding a piece of wood when planing.Pay_phones -desk is to the right of the phone. The desk, because I had to turn sideways to write left-handed. The desks that are connected to chairs are mostly for right handers and this creates difficulties. There are NOT enough left-handed desks in schools. The desks that are designed for righthanded people. Even at a local university there is limited number of left handed desks and there are positioned to the back of the class and on the right side of the classroom and other students complain about them. The desks with the chairs attached - on the right side. the desks with the tops attached. made for right handed people. hard to get in and outand also to write. arm and hand would get tired from having to hold it up. there were a few left handed desksbut those were always off to the side of the classroom to where you couldnt really see. the double seated tables at primary school, but high school made me adapt to single seated tables so you don't bump elbows with people when they are pushed together because you are use to the limited space. the flip-up desks in college. I had to use the one from the desk next to me on my left. The hardest thing was I always had the right handed desk and would normally do my work on my lap. Slumped in a chair. I still slump today posture is a big issue. The left-handed scissors were very blunt therefore difficult to use and during textiles I sometimes had to use right-handed scissors to cut out the fabric! The manual wall sharpener is best suited for a right-hander. The desks have the arm rest on the right side. Even at the university, there are few left-handed desks, and sometimes all the desks are too close to each other, so it is still quite uncomfortable. The most difficult thing were those chair-desks with the extended right side desk area. Simply horrible for a leftie! The mouse was a challenge for me, but not sure it was because of being a lefty. Today I can't function with a left-handed mouse. Hate them! The notebooks make it hard to write with the paper in it because the rings are on the left side of the paper. The Pencil Sharpener, it's on the wall and I find it very difficult to crank the handle with my right hand but theres no way to get at it with my left hand. the school does not have any left handed guitars or bass guitars so I couldn't learn properly, and they don't have enough left handed golf clubs when we have to play that. The scissors and the desks with the arm rests on the right side. The scissors and writing of course. I praise my parents for insisting I learn to type! The repetative math tables on record (3x1 is 3; 3x2 is 6; etc.) drove me to frustration. My brain doesn't work that way. No one ever tried to figure out why I couldn't do them as well as the other children. the scissors, but I 've gotten used to it. The sewing machines, could never thread them..also hand sewing a hem. teacher insisted the stitches MUST be slanting in the same direction, mine went opposite to everyone elses, after the 4th attempt I turned the whole thing upside down with bulk of item on desk instead of on my knee, and the stitches looked the same as the other girls..I had to learn to be devious!! The technical workroom tools are a hazard to left-handers! And the right-handed desks in lecture halls are difficult to write with. The whiteboard and the overhead because my hand blocks what I am writing when I write. things in chemistry are set for right-handed people and there aren't any left-handed things. This might sound real strange but I believe that it is more natural for me to flip the pages of a book beginning with the BACK of the book! Not EVERY time, but often, I have found myself interested in the back of the book first, then working my way toward the front. The only problem I had with that was, I would receive the information in backwards order. Magazines work well with me because articles are relatively small and if I read from back to front I wont have much confusion because then its on to ads and other stuff that doesn't require order. Those all-in-one desk / chairs with the arm rest on the right side of the chair. Left-handers writing arm is dangling out in air while writing. Those stupid desks that are designed for right-handed people. There is no writing space on the left side of the desk. All of our high school desks are for "NORMAL" people. Those white out thingies...where you grip it with your right hand. It gets all messed up if you use the left hand. And pencils in general because they smudge and I got a bump on my finger from holding it over the years. Throughout my school life I have always been trained to use my right hand, even though I was left handed and therefore I don't really struggle, even though I would have preferred to use my left hand. Tin openers, sharp knives and hockey sticks. wall mounted pencil sharpeners were hard for me, and the college style desks, with the kidney shaped desktop that's only on the right side. when we use a protractor, or ruler, I cant read the measurement because my hand covers it! When we were learning calligraphy. I can remember holding the pen at a right-hander's angle and doing a very good job in spite of it all. White boards are the most common problem at my setting, the writing gets rubbed off as the child goes along if an inappropriate penhold is used. White boards, blackboards etc & that's as an ESOL tutor. whiteboard pens & interactive white board. Mouse in ICT suite - no lefthanded mice! Woodworking equipment and power tools. All are designed for right handed people. It is dangerous to use them left-handed, so I'm forced to use the right-handed. working in small tables in groups of six children is very hard. Worst--large paper cutter. Scantron machine also bad. Writing on board or flip chart. Years ago,I adapted to the right handed tools. Yes scissors are the worst. yes.when I was studying in college, I found that the chair that with a table on top which normally found in lecture room, the design is terrible, because the "table" is in right hand side, so it is extremely difficult when using for example my back and shoulders always feel hurt because no support on the left hand side..